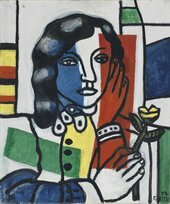 Fernand Léger, Young Girl Holding a Flower (Jeune fille tenant une fleur) 1954 © ADAGP, Paris and DACS, London 2018. © The Fitzwilliam Museum, Cambridge. 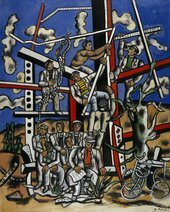 This exhibition brings together more than forty works by renowned artist Fernand Léger (1881–1955). Léger was enthralled by the vibrancy of modern life. His paintings, murals, film and textiles were infused with the bustle and rhythm of the metropolis. He drew on photography and new forms of communication that boomed during the ‘mechanical age’ of the twentieth-century such as typography, advertising and graphic design. Léger’s work was heavily influenced by his surroundings and his experience of modern life. Included in the exhibition are his collaborations with architects Le Corbusier and Charlotte Perriand. Also on display is his experimental 1924 film, Ballet Mécanique. This, the first major UK exhibition dedicated to Léger’s work in thirty years, celebrates the artist’s desire to make art part of everyday life. Not to be missed. Fernand Léger Study for 'The Constructors': The Team at Rest (Etude pour 'Les Constructeurs': l'équipe au repos) 1950 © ADAGP, Paris and DACS, London 2018. Photo: Antonia Reeve. 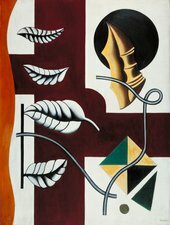 Fernand Léger, Leaves and Shell (Feuilles et coquillage) 1927 © ADAGP, Paris and DACS, London 2018. Fernand Léger and Charlotte Perriand Essential Happiness, New Pleasures. Pavilion of Agriculture, Paris, International Exhibition (Joies essentielles, plaisirs nouveaux. Pavillon de l'Agriculture, Paris, Exposition Internationale) 1937-2011 © ADAGP, Paris and DACS, London 2018. Photographic Archives Museo Nacional Centro de Arte Reina Sofía. 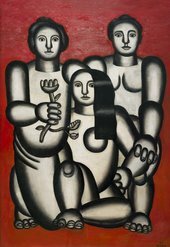 Fernand Léger Trois femmes sur fond rouge 1927 © ADAGP, Paris and DACS, London 2018. Image courtesy Cyrille Cauvet/Musée d’art moderne et contemporain de Saint-Étienne Métropole. Tate Kids What Is That?